The species is widespread, but becomes more scattered in northern Britain. It seems to be restricted to the more western parts of Europe (Töpfer-Hofmann, Cordes & Helversen 2000). Pardosa saltans occurs in forests, woodlands and copses and sometimes nearby grassland and hedgerows. It seems to be largely restricted to old and ancient woodland sites, where it may be numerous running over the ground in open clearings as well as amongst litter within the shade of the wood. Adults mainly occur in early to mid-summer, with females later, occasionally even until October. 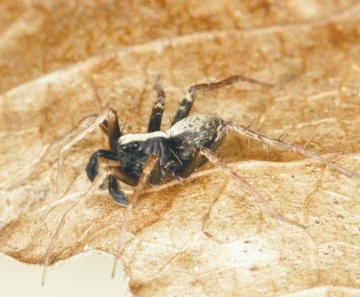 The spider may be localised, but is usually found in numbers. P. saltans was described by Töpfer-Hofmann as a species distinct from P. lugubris and so far nearly all British material examined has proved to be P. saltans. All old records have been mapped as P. saltans. Pardosa saltans male. Leaf litter in mixed woodland.